This program introduces students to the essential knowledge and skills needed to work in a professional construction environment by exposing students to real-world carpentry careers and practical business aspects of working in the carpentry trade. Regional Concerns prepare students for different situations based upon the regions of the United States. Helps students prepare for future certifications by meeting the NCCER Standards. Step-by-step illustrations, photos, and graphs guide students through each key process. Builder’s Tips provide helpful tips on how to best use tools and how to optimally perform different tasks; Job Safety alerts students of the most safe and practical ways to use different tools and perform different tasks. 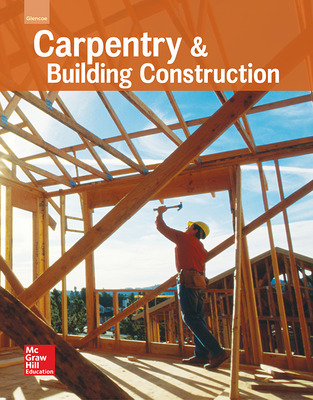 Construction Careers are featured at the beginning of each unit and allow students to read about a specific career in construction and the academic skills and abilities needed to reach that position. 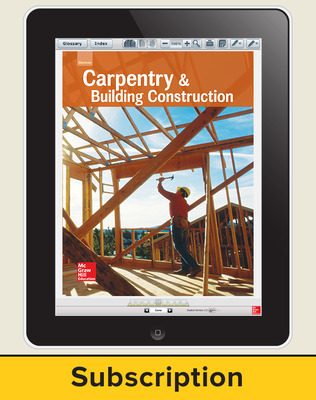 Carpentry & Building Construction ©2016 features online resources on the McGraw-Hill ConnectED platform which empowers teachers to easily teach program material, manage classroom assignments, and engage every student. Teachers can access the student eBook, digital resources, assessment and planning tools in one convenient location. Print teacher editions are available print-on-demand on Create™. 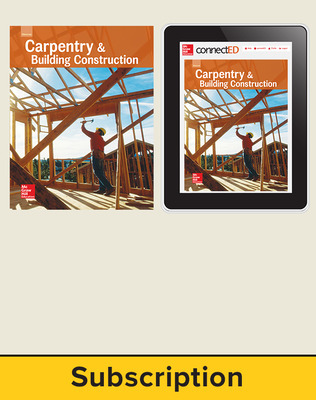 Click Explore Create™ to find Carpentry & Building Construction today!